Once upon a time there were three pink boys (more or less) and a Rarr, who all played in Brian’s son Toby’s bedroom. They liked the midnight tea parties, the magickal ambience, and of course, they liked Toby. Unfortunately, the Pink Boys got too rowdy, and Brian had to throw them out into the garden, which was where they belonged anyway. The Rarr learned from the experience, in a rarrish way, and it quieted down a bit during the midnight hours. Rarrs are not naughty or wicked, just energetic. They are also not very discriminating. They like to join into whatever excitement is going on and add energy to it. In a way, they are pure potential, and they potentize whatever is happening. Rarrs are attracted to mobs rioting and to meditation groups rising toward ecstasy and to any other strong energy states. Think of the rrrarrr of a growling dog, the rrrarrr of an engine revving up, the rrr of a purring cat, and the arrr in Arrrugh! As I say, Rarrs don’t discriminate. It is up to us to do that. They put a live spark into whatever is happening. It is our choice what we do with it. 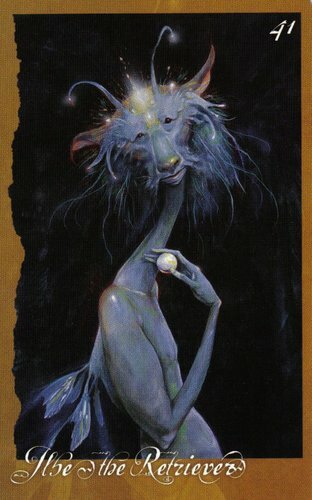 A Rarr in your cards encourages you to be especially attentive to what you are doing with your energy and intentions. Don’t get carried away by the Rarr’s bouncy enthuisiasm, but do take advantage of the energy. You can accomplish a great deal with the energy being made available to you. This is a good time. Note that the Rarr is not grounded – and is not meant to be – but humans need to keep their feet firmly on the earth. When you encounter the Rarr, breathe slowly. Center. Earth yourself. Be clear about your objectives and then go for them. The Rarr upside down indicates a terrible problem. Both the querent and the Rarr are losing (or have lost) control and are thrashing about in midair. Faery glamour and faery zaps are running wild. Illusions and delusions are rife. Misunderstandings escalate. A cold shower is definitely in order. Practice grounding exercises. Meditate. Back off and look at things coolly. This may not be enough, but please try. Office of Unclaimed Property, Hopes, and Wishes. Loyalty. This sort of busybody helpfulness is just one of Ilbe’s tasks, however. He also has more important things to do. Ilbe is a protector. He retrieves and safeguards our lost hopes, forgotten dreams, and mislaid keys. (My keys were under a stack of papers, stuck to the floor with peach juice – not a place that I’d put them myself, but certainly safe from most key thieves.) He holds these seeds of our potential futures carefully and delicately until we are ready for their return. Sometimes we don’t think we are ready for them or we have given up hope altogether, and then he may arrange reminders for us – events or people in our lives that bring back memories of our past hopes and dreams. When that happens, we need to look at them again and consider how we might manifest them in reality. Ilbe is trying to remind you of something you’ve lost – a hope, perhaps, or a dream. You may have thought it gone forever, but he is holding it out to you for reconsideration. He thinks you can do something with it now. The way may not be obvious, but his clever nose has scented a path, a potential opening for bringing this into your life. Sometimes, Ilbe may be saying that a long-awaited dream is at last arriving on the scene and there is nothing we need to do but open our hearts and minds to it. However, we usually have to work for it. Another attribute of Ilbe is loyalty. Is it time to stop saying “I can’t” and take a look at “I can” instead? Perhaps something important in your life is being held back by negative attitudes, but we have choices about our attitudes and can change them when they are not helping us. Alternatively, Ilbe may be saying that this is not yet the time for the germination of this seed. It may be that other things need to be dealt with first. What might you need to clear out or finish up before being able to properly plant and nurture this seed? Are the things in the way weeds, which should simply be pulled, or valued growing things that we would wish to care for before planting something new in that space in our lives? Auspicious beginnings. Birth. Growth. Joy. Hope. From her crown of light to her star-jeweled toes, the Maiden is pure joy. She is the face of the force that generates growth throughout all the worlds. When she smiles, troubles melt. Where she dances, flowers spring from the ground and burst into bloom. It is from the Maiden that the pixies learned the dance that keeps the otherworld turning – and probably our world, too, for that matter. She is newly born every morn, and she carols her plangent song of growth for all beings in all the worlds. She sees the magick and the light in everything and takes endless delight in it. Yet even though the Maiden is so wonderful and powerful, she is a child and she needs to be cared for, nurtured, and cherished. When she takes the form of a flower, someone must see that she gets enough water and sun. Whenever we look after something new or young, we are caring for the Maiden, whether she is in the form of a blossom, a sapling, a baby, or a new idea. She, in turn, is likely to switch between joyfully and gratefully receiving such nurturing and insisting on an independence that she really isn’t ready for yet. She knows, deep within herself, what she needs to do and become, and become, and she moves toward this with the directness of a child. The Maiden also has the simplicity and curiosity of a child, seeing with unclouded eyes. She has an openness to life, love, new things, and new experiences. Every moment with her is an adventure, filled with playfulness and hope. Innocent, she is awakening to and learning about the world. Much of her learning comes with laughter and silly jokes, and she trusts what life gives her. Every time we allow ourselves to be filled with joy, we become more like the Maiden. The Maiden signifies new beginnings and growth. You couldn’t ask for a more auspicious card than this if you are beginning something new. Spontaneity, joy, growth, exhilaration, and promise for the future are signified here. We must note also that, in the early stages of any process, there is vulnerability and a need for protection, shelter, and guidance, but there is also a magickal impetus toward burgeoning growth. Trust the process – but take care of the details as well. The Maiden is also the inner child who needs to be under the supervision of a competent inner adult in order for her to feel secure and loved. She is not happy when we spoil her. Consider what is growing in your life. Make a list of your hopes, dreams, and plans. Look for the growth within you, and think about how you can cherish and nurture that. Bless the growth you see around you. In the Maiden reversed, we find her virtues turned into flaws. When her energy is blocked, we don’t allow ourselves to dream, to hope, even to plan a future that is anything but minimal and mundane. We live a cold, sterile, joyless life. When we twist her energy we become impulsive, unthinking, gullible, lost in dreams that never get translated into reality. There is a tendency to live in fantasy and deny reality, and there is definitely a lack of grounding. Life in a floating soap bubble is perilous – and that is where she is. When living in a dream world has become habitual, the addiction to fantasy is hard to break. It cannot be changed from the outside by others, and even from the inside, there is usually no desire to break through into an unhappy reality until the fantasy world itself becomes too painful to live in any longer. 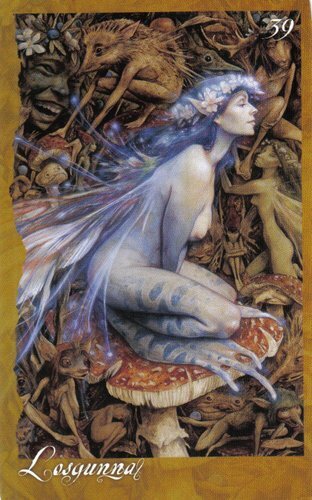 When the Maiden’s energy is seriously reversed, this card can indicate crippling pessimism – an attitude that when possessed means the possessor sees the worst in everything, expects the worst from life, and gets it. Such an attitude creates its own misery and denies one the possibility of joy. When such a powerful energy as the thrust toward joyful growth is inverted or twisted this way, it is still a powerful energy – and usually requires an equally powerful experience to break free of it. But there is always hope, and those outside the fantasy need to remember that, even while being realistic about the difficulties of changing this state. Someone needs to be an adult here. Sunken treasure. Discovery of self. Adventure. The realm of Losgunna, the Frog Queen, is extensive, both below and above the waters. 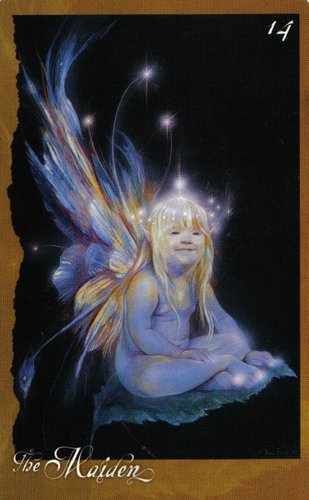 Faery waters are made up of human emotions, sometimes beautifully clear and sparkling and sometimes disgustingly murky. Different faeries are attracted to different waters. You would hardly expect to find the Soul Shrinker or old Gloominous Doom happily splashing in clear or sparkling waters, although you might find Nelys the Alchemist at a murky pool, holding her nose as she waves a clarifying wand over it. Most of the bright faeries avoid such places. However, Losgunna knows that there are treasures, lost in disasters or abandoned by pirates, to be found in the murkiest of waters. Exploration is what this card is all about, and through exploring and seeing what we really are, warts and all (Losgunna would like you to know that she doesn’t have warts), we discover parts of our talents and potentials that have been hidden by old traumas and misunderstandings, or by lack of opportunity. Losgunna’s explorations are not limited to the realm of the emotions but also include the world. She wants us to dive deeply into new experiences involve flying high. Listen to different styles of music with open ears, try new tastes, look at new sights, and try them all with the open willingness of a child. She especially wants us to explore new ideas. Have you ever noticed how people tend not to explore the territory they live in? How they only visit the special places there when they are trying to entertain someone from out of town? We do the same thing with so many aspects of our lives, and then, sometimes, we grumble that life is dull. Life is always adventurous for adventurous people and boring for boring people. My grandmother told me this when I was nine, and I expect she got it from Losgunna. She also told me that if I didn’t have anything interesting to do, I might as well clean up my room. I took this lesson to heart and so can you. If life seems boring and you feel stuck in your puddle, either explore the parts of the puddle you haven’t really seen before or jump out and do something new and interesting. I’m sure you, dear reader, are not a bored or boring person – boring people don’t read blogs like this. Losgunna tells us to pay attention to our dreams, to listen to the murmur of the waters, to note the patterns in the damp, fallen leaves, to listen for the distant, high sounds of angelic music among the stars. She also suggests soothing baths, hot tubs, Jacuzzis, trips to the nearest spa or hot springs, and dips in the handiest sea, pond, or mountain lake. Mud baths also help us quiet down and become strong enough to explore her territory, which is the earth and the waters, from the depths to the heights. As important as it is to explore the inner realms, she tells us that exploration of the outer realms is also vital. She suggests that we go places we have never been, try things we have never done, take classes in subjects we always meant to study someday, maybe even learn a language and see where that takes us. Explore widely and deeply in our own world so that we develop the adventurousness of our spirits. It almost goes without saying that she recommends exploring Faery. She also suggests kissing any metaphorical or actual frogs you encounter to test for princes or princesses – but I don’t know how seriously you want to take that suggestion. Bored? Tired of the same old thing? A question we must ask ourselves is are we boring as well as bored? The message here is to try the things suggested above (or invent our own) before Gawtcha takes pity on us and liberates us from our firmly stuck-in-the-mud state. It is so much more fun to jump than to be pushed. The Singer of Transfiguration tells us that we have been through the gate, we have passed through the initiation process, and we have reached a new way of being, reflecting deep transformation within ourselves. Things will never again be what they once were. Things will never be seen in the same way by us, and this is a good thing! This Singer’s joyful, passionate, bright blaze of color heralds a time of fulfillment and accomplishment. As with the other Singers, the power and joy of this one radiates especially strongly to the things and beings symbolized by the cards around it. Like the reborn, renewed phoenix, this Singer is aflame with vibrant, expanded life. 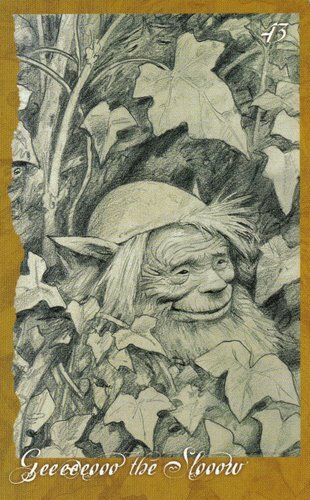 There really isn’t much I can say about this – not even the faeries seem to have anything to add. They are just sitting around here, smiling blissfully, even ol’ G. Doom, and humming an ethereal and beautiful melody. And the cat in my lap, Sylvie, is purring so loudly it sounds like she is singing – as indeed she is. So are we all. Jackpot! 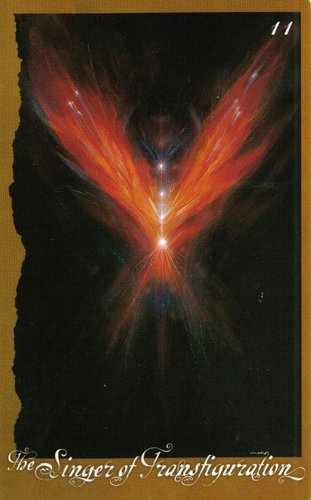 This card in a reading signifies the joy of success after a time of struggle. A new way of life has been accepted and is being integrated. A sense of inner peace is growing. The struggle has all been worth it. This is a time of consolidation and joy, and is both a reward for past achievements and a time of preparation for the next climb up the path. 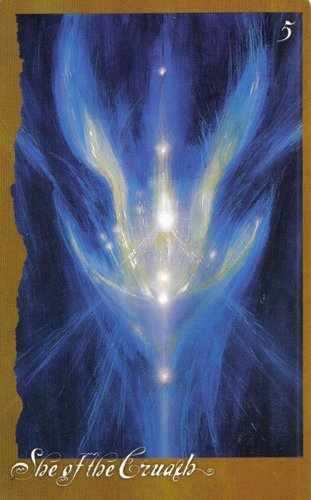 Even reversed, this card simply suggests that the realization or completion of this process is just around the corner. Enjoy! Geeeeeooo is the Gnome of Slow Processes. How long is it going to take for that water to wear that rock away? How much has that mountain grown (or eroded) in the last millennium? Geeeeeooo is there watching attentively, making certain that things don’t happen too fast, resulting in a slip-shod job. It is he who watches the waves slowly encroach on the shore, wearing away the cliffs. Elsewhere, to keep things in balance, he watches certain mountains slowly grow taller. Geeeeeooo is also the master of the clarification process whereby we let something sit quietly while the impurities slowly settle themselves out, allowing the substance to purify itself in time. Geeeeeooo doesn’t understand why we rush about so, missing out on the slow changes in the worlds around us. He is amazed at the stress and problems we create for ourselves by doing that. He wonders how we can survive if we don’t sit down and watch the sunrises and sunsets or if we “don’t have time” to enjoy our lives – especially if we are so busy rushing around with the idea that we are making things good for ourselves later but never now. The thing about Geeeeeooo’s process is that they all proceed in good order. Fruit ripens on time, grain is ready at harvest time, and the moon and earth circle each other in equitable balance, neither too quickly nor too slowly. These natural processes work well, and in our own lives it is helpful to use them for models, finding the right pace – the pace that allows natural, low-stress growth and progress and joy. The world isn’t turning any faster, so we might ask ourselves why we are trying to cram more into our days. Slow down. Sit back in your chair and think a little. Why are you going so fast? What do you hope to gain from it? Are you metaphorically trying to push the river? What kind of stress is being created in your life by hurrying? The presence of Geeeeeooo in a reading indicates that the situation or issue is part of a long process that cannot well be hurried. It is important to settle in for a long haul and to set a pace that you can maintain for as long as needed, while remaining relaxed and patient. If you are short on patience, try cultivating your acquaintance with the Singer of the Chalice. You will find life much more delightful if you do. Geeeeeooo himself clearly does, to judge from his face. Unnecessary delays or even stalling may be going on here. Whether the querent is the cause or the victim of this, it may be time for him to give things a tactful but firm push to get them in motion. Geeeeeooo may be in charge of slow processes, but they should be actually proceeding and not stuck. The Receptive Principle. Nurturing. Fertility. 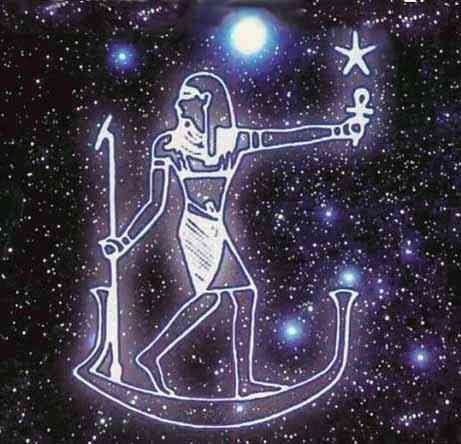 This is the Great Goddess, the many-named mother of all, and all goddesses are attributes or aspects of her. Her cup, the Cruach, overflows with bounty for all. She is the yin energy of the universe – nurturing, compassionate, and wise. She gives form and brings into manifestation the will and life force of He of the Fiery Sword. His is the intention, the action, and hers is the manifest reality. In a sense, she is the Cruach holding all the worlds within her being. She of the Cruach is the holder of all of our sorrows and all of our joys. Her Cruach, the miraculous chalice, is the womb of birth and the cauldron of rebirth, the chalice of healing, the container holding the germinating seed. She is the body, the soul-shrine that holds the spirit and keeps it from being lost or dissipated in a formless fog. She is pattern and form in the abstract and in the specific. Within her we take form, grow, achieve fulfillment, and let go of that form to move on to the next phase of our being. All of the universe, each individual particle, every being, is cherished by her. She of the Cruach may indicate a form of pregnancy, a necessary time of nurturing and development. We need to be open to her overflowing grace. She may also indicate a need to allow her nurturing grace to flow through us to others in the form of unconditional receiving, of making the best of what we are offered. She also reminds us that unbounded love and grace is ours, just waiting to be accepted. 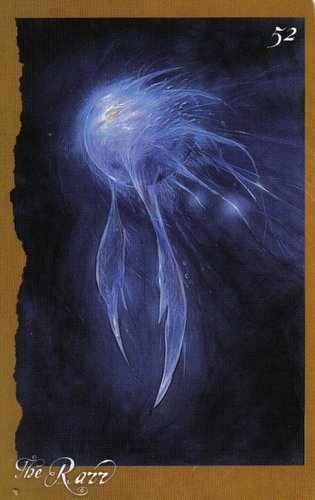 The presence of this card in a reading radiates comfort and nurturing to the cards around it.